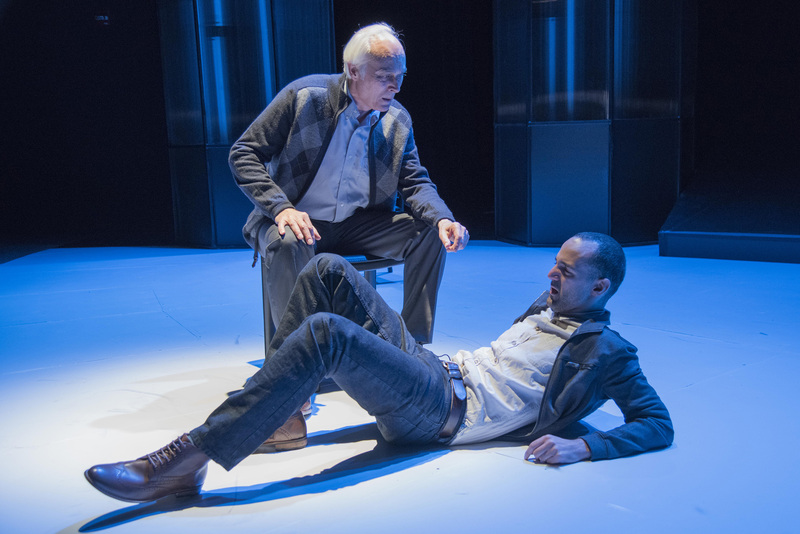 WATERTOWN – Caryl Churchill’s 2002 play “A Number” was inspired by the furor around the cloning of Dolly the sheep, sparking ethical questions about what might happen if and when the practice becomes possible with humans. In the skilled hands of actors Dale Place and Nael Nacer and director Clay Hopper, a cautionary tale unfolds on what could happen should human cloning ever become feasible. As Salter, a sixty-something father, Place projects an earnestness leavened by deceit in his interactions with three of his progeny – Bernard 1, the original son, Bernard 2, a cloned copy, and another clone named Michael Black,a teacher and a family man with children, all played by Nacer. After his wife died, Salter arranged to have his then-young son cloned, giving him a chance to raise his child again while avoiding the parental mistakes he’s made with Bernard 1. He embues all three of his characters– Bernard 1 and 2, and Black – with markedly different personalities and vastly different attitudes towards their situations. Place as Salter assures Nacer as Bernard 2 that he is actually a clone of his “brother” Bernard 1, who was killed years ago, and that he was unaware that the doctors had made several unauthorized copies of Bernard 1. But Bernard 1, it turns out, is still alive and livid with his father after learning about the clones, and for having been sent away as a child. The animosity between the “original” and the “copy” will grow, and therein lies the rest of the story. In a 1959 episode of the iconic TV series “The Twilight Zone” called “Walking Distance,” a 36-year-old man is having his car repaired in a garage in a town adjacent to his hometown. He decides to walk back into his hometown and finds it unchanged since 1934. He encounters his younger self on a merry-go-round and approaches the youngster, intent on giving him some advice . The youth is scared and the man ends up pushing his younger self into the ride’s machinery, injuring the boy’s leg, and suddenly finds as an adult he has developed a limp. “A Number” reminds us that when we tinker with the natural order of things, the results can be devastating. But will that stop us from creating a cadre of Bernard’s when we have the chance? The New Repertory Theatre production of Cartyl Churchill’s “A Number.” Directed by Clay Hopper. Scenis designer Cristina Todesco. Costume designer Penney Pinette. Lighting design by Mary Ellen Stebbins. Sound design by Phil Shroeder. At the Mosesian Theatre at the Arsenal Center for the Arts through Nov. 1. wwwnewrep.org.